Each Spectrum picture is a screengrab from X128 in 320x200 mode. So, yes, SCR versions of these do exist. Now, I take the time to expand this fiendish fakery to the Tandy CoCo and Dragon. This is an old US Gold screenshot. True or false? This has been nearly finished for a long time, so I just quickly tidied it up. How fake is fake? Pitch Protoype TAP file. I tried a bit of "stack pointer magic" to try and get a full screen scroll of just the pitch data (no lines, no players, etc...) Unfortunately, the screen always catches up (except on the Pentagon). The 48K has a big tear and the 128K has a slight tear, but the main point is that once sprites and the pitch lines are added - the tearing would be severe and it might not even run at 50 fps... Oh well. Sensible Soccer (in this case the SMS version, which nicely provides a 256x192 resolution to work from) must stand a fair chance of being a decent Spectrum conversion. The only problem is the large scrolling area, but maybe some stack pointer magic (or even a bare pitch with just the lines drawn) would solve this problem. I decided to do some screens after a post on the WOS forums. 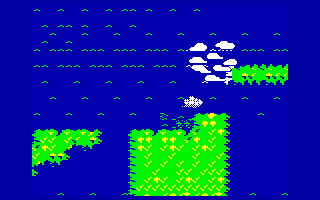 I was a bit lazy though, so I did an early scene from Paradroid (C64) and the two stages of the title screen of Aztec Challenge (C64). Paradroid is an example of a game that could be converted easily(*) to the Spectrum. Only the bottom two-thirds of the screen scrolls, there are few sprites on screen and each one is a single colour. However, you'd need some sort of flip-screen or 8-pixel scroll to make the game like this screen, as you'd get a lot of attribute overlap if you scrolled smoothly. The inability to mix bright with non-bright within a character square makes the screen a bit more bold than I'd originally intended. Now this is really lazy - two very simple screens here. 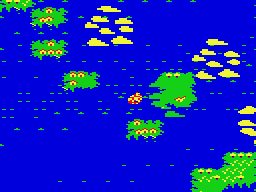 I did them because I'm half-tempted to try and port this old game onto the Spectrum 16K. (Even though the original's main file is 28K). Aztec Challenge - Cosmi Logo. Aztec Challenge - Title Screen.